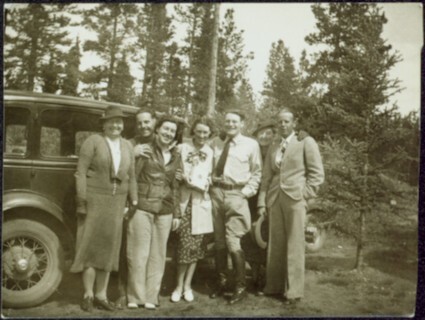 Group of seven men and women stands in front of car in dirt road, forest in background. Sarah Glassey stands on far left. Similar group also featured in items 2009.5.2.275 - 2009.5.2.294. Stamped annotation on recto of photograph: "29".